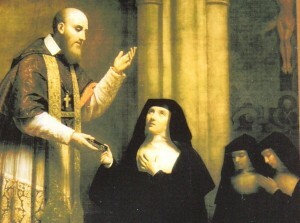 Saint Jane Frances de Chantal (1572 – 1641), wife, mother, and foundress of the Order of the Visitation. She had the assistance of Saint Francis de Sales with the Visitation. Saint Jane Frances is among the few saints that we know who is wife, mother and foundress. Many vocations in one person.